We appreciate that your Range will probably take ‘Pride of Place’ in your kitchen so you’ll want it cleaned professionally and with care and attention to detail. With all of our franchise owners having undergone training to ISO standards you can rest assured that we have the knowledge, expertise and products to leave your Range in immaculate condition. 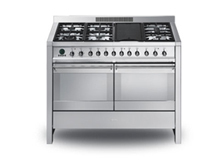 Our service is recommended by Lacanche, referred by Britannia and has proven to produce spectacular results on all other Range style ovens including Rangemaster, Smeg, DeLonghi and Belling to name just a few. Our primary objective is to provide a professional oven cleaning service for you that you’ll remember for all the right reasons so you’ll be comfortable and confident in recommending us to family and friends. We also understand that your Range will have been a sizeable investment that you want to protect. Hours that you’ll probably spend doing something more enjoyable while our trusted experts get down to work! It’s also worth noting that our truly bespoke product we use for deep cleaning the interior of your Range has been approved by The Vitreous Enamel Association (VEA). We feel that this is very important to explain as the interior of the majority of ovens is coated with this material. Approval by the VEA means that our product will leave the coating sparkling without any adverse effects. Naturally we’d suggest that any inferior product not bearing the VEA logo might not perform so well and may in fact, damage the enamel surface. We’ll be delighted to provide you with a free quotation for valeting your Range based on the make and model. Range sizes vary a great deal as will the time taken to undertake the task! It will also be a pleasure to quote for your chimney hood over the Range while you’re on the phone…we look forward to your call.